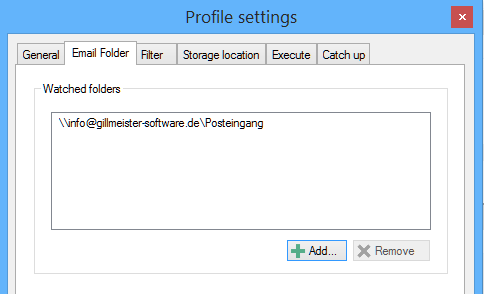 Click in the program on the "New" button to create a new profile. A new dialog box opens, in which the profile is configured. On this tab, the name of the profile and an optional description is set. For example, the profile name could contain the sender of the email and the description text could be the interval in which the email is received. 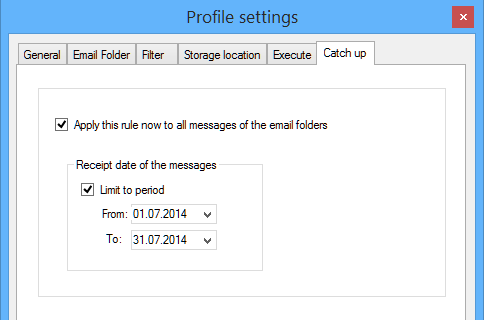 Next, the email account to be monitored for incoming emails with attachments is set. Just click on the "Add" button and a new dialog box will appear, in which all email accounts that are set up in Outlook are listed. Select from the desired email account the folder "Inbox" and click then on "OK" to confirm the selection and close the folder selection window. Optionally, multiple email accounts can be added, provided that they should have the same criteria and settings such as the storage location for the email attachment. If emails from different senders or emails with different content arrive on the selected email account, the application of a filter is needed to ensure that only the desired email attachments are automatically saved. To do this, enter the known email sender name, for example "Sample Inc." in the text box labeled "Sender name contains". Additionally, an integral part of the attachment file name such as " invoice.pdf" should be entered in the text box "File name contains". Now the location, in which the automatically extracted email attachments are stored is to be determined. First, specify the target directory, for example "D:\Invoices\Sample Inc.\". Then, one or more properties of the respective email can be optionally determined from which one or more sub-folders will be created dynamically. For example, the four-digit receipt year of the email can be used – there is a variety of properties to choose from. The same goes for the file name under which the email attachment is saved - this also can be generated dynamically based on the email properties. Furthermore it can be determined how the program should react if a file with the same name already exists. This step is optional. Here, a program can be set, which is invoked by Outlook Attachment Extractor after the extracted attachment has been saved. The previously stored attachment can be passed as parameter to that program for further processing it automatically. 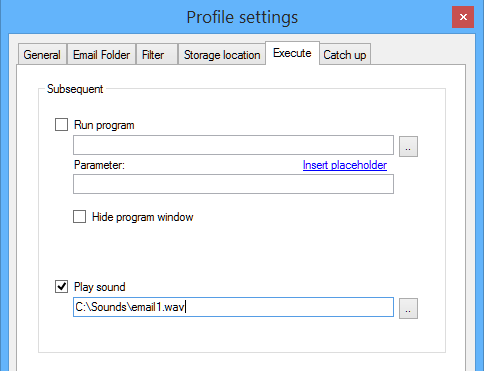 In addition, a sound file in wav format can be played after successfully saving an email attachment. 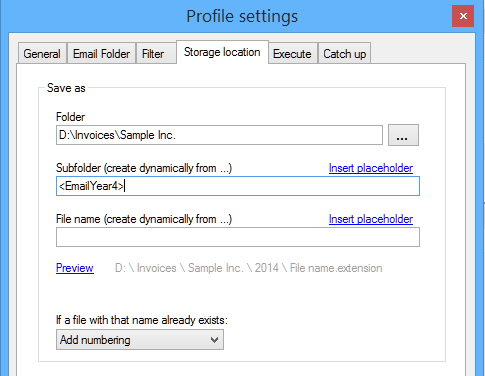 Here you have the possibility to apply the profile to all previously received emails of the specified Outlook folder to find not yet been saved email attachments or to save the attachments into a new filing structure. Optionally, you can specify a date range to e.g., search only in the emails of last year. Finally, click "OK" to apply the settings made. The new profile appears in the profile summary in alphabetic order and is enabled by default. 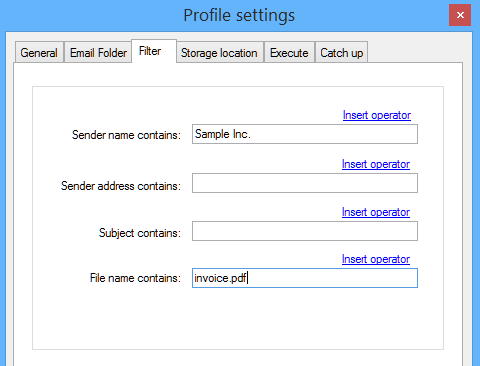 The profile will now be applied to all emails received with Outlook and the attachments contained are saved automatically as specified in the profile.